There are many facilities in the world known as cleanrooms. A cleanroom is a special industrial facility, usually used for either scientific research or for state-of-the-art manufacturing, that requires a highly controlled environment free from dust or other contaminants. The most famous cleanrooms in the world are ones used by the big scientific establishments - such as the incredible NASA SSDIF (Spacecraft Systems Development and Integration Facility) cleanroom used for work on space hardware projects such as the Hubble Space Telescope. Cleanrooms are graded and given classifications according to the number of particles in the air - and are much, much cleaner than your kitchen even after you have been scrubbing it all morning. Cleaner even than your kitchen was the day it was installed. Now unless like NASA you have megabucks to spend, or are absolutely obsessed with cleanliness, a cleanroom is obviously not a realistic option. However, it might be highly revealing for us to examine cleanrooms - because they really do need dust solutions that are guaranteed to work! So if we can learn what they are using, we have a pretty good idea of what might be effective in our own personal quest for pure air. And what do we find...? 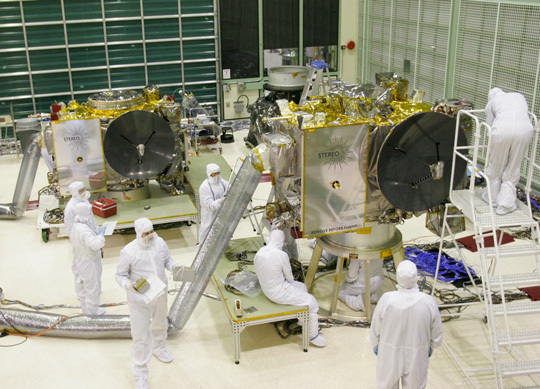 The sparkling, state-of-the-art NASA SSDIF cleanroom, which NASA's official web site nasa.gov claims is "1,000 times cleaner than a hospital operating room", uses HEPA filters continuously, to purify the air! Ok, so it's a gigantic, top-grade HEPA filter covering one entire wall - but I think we can safely say that if NASA uses HEPA filters in mission-critical applications... it's almost certainly because they are the best technology available for air purification. In summary, HEPA filtration has become the industry standard for particulate filtration in environments where air quality is of critical importance - such as cleanrooms and hospitals. A sparkle-fresh NASA cleanroom facility, complete with spacecraft under construction. It's so spotlessly clean in there that we imagine you could possibly eat your dinner off almost anything (horizontal) in this room - although it might upset a few people so please don't tell NASA it was our idea. Have you ever tried cleaning tomato ketchup off a solar panel in zero gravity? Didn't think so.